I needn't have worried. If there's one thing New Orleans will hold on to long after everything else has floated away, it's good food and drink. There's a reason about half of those looting photos involved beer. Though NOWFE did feel the effects of the losses, if you had never been to it before, you wouldn't have had the faintest idea that anything out of the ordinary had ever happened in your host city. Though other commitments kept me away from this year's Vintner Dinners, the list of hosting restaurants was both familiar and as prestigious as always. A full 37 fine restaurants held dinners, and though we did miss some of the usual suspects, like Chateaubriand and Brennan's, it was heartening to see that so many of New Orleans's finest establishments were up and running and helping people to forget their troubles with delicious food and happy-making beverages. Despite the significant drop in local population, many of the most popular venues sold out, as usual. On Thursday night, the traditional Royal Street Stroll took place. Though some shops may have closed down, plenty more were still open, still filled with lovely and expensive items to tempt customers. Music filled the street, the shops were open and offering tastes of wine, and we can only hope that some of the alcohol-assisted sales will help them to remain open far into the future. I was attending a small conference in town, and I was very pleased to think that a few of the attendees, kept busy all day by seminars and workshops, might at least have had the chance to shop in a few of these great stores when they stayed open later than usual for the Stroll. I didn't have much to compare it to, but it looked quite lively, and like a good time for all. 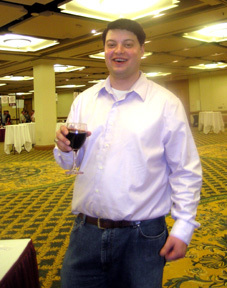 Friday evening was the first Grand Tasting. (Another is held on Saturday afternoon to accommodate more visitors.) This is the big event for NOWFE. Would it measure up to years past? It did. It's possible that there were slightly fewer participants this year, but there were still so many that I couldn't even begin to dream of sampling them all. In three hours, I tasted many great wines and ate some delicious food samples, but I probably missed as many wines and displays and restaurant booths as I was able to hit. To give a concrete example, at last year's Friday night Grand Tasting, 47 restaurants attended to provide tastes of their cuisine. This year, 40 came. I think I managed to sample about 10, so I didn't notice the difference at all. 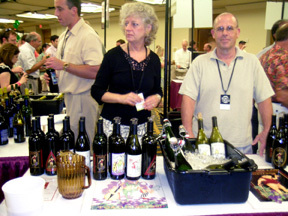 In years past, the Grand Tastings have been held in the Convention Center. This year, it was held in the Hilton's Grand Salon and Grand Ballroom. The only real difference that made were two: the bathrooms were easier to find, and the displays were split up between two large rooms instead of filling one giant one. This did make it a bit harder to browse and find your favorite wineries or restaurants, but one room or two, it's always going to be hard. And the wines? Like every year, there were too many to remember individual wines. In fact, after drinking wine for 3 straight hours, I'm lucky I can remember the evening at all. There were a couple that stood out, at least partly because I tasted them early on. The 2004 Earthquake Petite Sirah from Lodi Vineyards was full of chewy, dense flavor, and won one of only four Best in Show prizes, and was well worth it. To contrast it, I enjoyed Toad Hollow's Risque Methode Ancestrale Sparkling Wine, a lightly sparkling, lightly sweet, lightly alcoholic wine that reminded me entirely of a Californian Moscato d'Asti. To their credit, Toad Hollow also bottled up a Merlot, dubbed it Katrina Recovery Merlot, and donated the proceeds to hurricane relief. It sold out almost immediately. I'd like to say more about the event, but there are only so many ways to say, "Drank wine. Ate delicious food samples. Got completely plastered. A good time was had by all." So I'll stop there. One word of warning, though: if you plan to attend the Grand Tasting, make sure you won't be getting into a driver's seat for some hours afterward--preferably the next day. I was lucky to be able to walk back to my hotel, which proved challenging in its own right. And there were numerous other events I wasn't able to attend--the Seminars, the wine-themed musical, the Sunday Champagne brunch--which were, I'm sure, every bit as good as the events I went to. Mark your calendars now for the 2007 NOWFE. It's held every Memorial Day weekend, Wednesday through Sunday. I would love to hear more about this ?